Thanks to BHPian reddevilgautam for sharing this information with other enthusiasts! 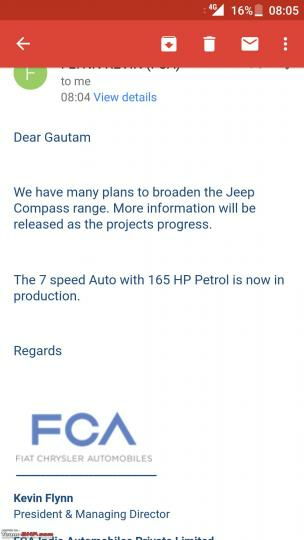 As per the latest information, production of the Jeep Compass petrol automatic (AT) variant has started and it is expected to reach showrooms by next month. The Jeep Compass petrol automatic is available in two trim levels - Limited and Limited Option, priced at Rs 18.96 lakh and Rs. 19.67 lakh (ex-showroom, Delhi) respectively. Jeep had launched the Compass on July 31, 2017. Since then, the company has been producing select variants of the SUV, depending on the demand and in a phased manner. The deliveries kicked off on August 6, 2017 with the diesel manual transmission variants, however, Jeep did promise that the petrol automatic variants would be delivered by Diwali. Additionally, Jeep might also add a sunroof to the equipment list of the Compass. If you recall, a Compass Limited 4x2 variant with additional features was spotted last month. The Compass is offered with a 1.4-litre, 4-cylinder turbocharged petrol engine which produces 160 BHP and 250 Nm of peak torque. The Sport variant gets a 6-speed manual gearbox, while the Limited and Limited Option comes with a 7-speed dual-clutch gearbox. 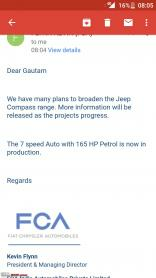 Jeep also has plans to launch a diesel automatic variant of the Compass in India. It is expected to arrive in January 2018.